A stunning debut novel set against the backdrop of 60s America – for all fans of THE GREEN MILE and THE SHAWSHANK REDEMPTION. Daniel Ford has thirty days to live. Accused of the horrific murder of his best friend Nathan twelve years before, he has exhausted all appeals and now faces the long walk to the electric chair. All he can do is make peace with his God. Father John Rousseau is the man to whom the last month of Daniel’s life has been entrusted. All the two men have left to do is rake over the last ashes of Ford’s existence. So he begins to tell his story. A breathtaking book…with lyrical descriptions of the lost innocence of childhood, vivid characterisation…acute suspense, this debut will surely win awards as well as please readers. The hype’s justified. You know you’re onto something from the opening line. … Compelling, insightful, moving and extremely powerful. A debut novel from a sparkling new talent, Candlemoth is a thriller set against a backdrop of a turbulent America in the 1960s. If you liked The Green Mile and The Shawshank Redemption, you’ll love this. 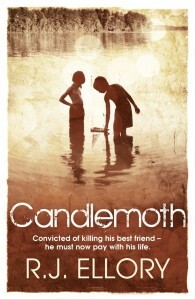 Set against the backdrop of civil tension in 1960s America and treading a similar path to The Shawshank Redemption, Candlemoth will have you gripped from start to finish. A story of great impact, so good in fact that you want to skip to the end to find out what happens. With his first published novel Roger Jon Ellory builds the relationships within the book so realistically that you can almost feel the affection and loyalty that Daniel and Nathan felt for each other. This is a breathtaking book. Ellory’s artless prose takes the story of Daniel’s coming of age and fall from grace and uses it as a metaphor for the destruction of the American Dream and the corruption of the American administration. A stunning indictment of the death penalty but a story that also bears testament to love and friendship and bravery. Roger Jon Ellory’s debut novel tells the compelling tale of Daniel Ford, a Death Row inmate sent to the electric chair in 1982 for the murder of his best friend. Daniel Ford is a totally convincing character and the story, told through his words, gains a reality and freshness. All the way through, we’re kept in the dark as to why Ford is standing accused of his best friend’s murder – until the shocking, emotionally exhausting climax. Shortlisted recently for the Crime Writers’ Association Steel Dagger. I loved it. It’s a death row confessional thriller of a white man accused of murdering his oldest friend of nearly 20 years, a black boy. The story of their lives unfolds against America’s history of the 1950s and 60s. A brutal prison tale, a small town relationship novel and a fast-paced thriller all rolled into one highly satisfying read. … I do recommend it highly.